An artist's illustration of Japan's new Epsilon rocket. Researchers in Japan hope to make rocket launches a smoother, less expensive process by equipping the next generation of launch vehicles with artificial intelligence. In this instance artificial intelligence , or AI, equates to greater automation and the ability for the vehicle to better perform self-checkups, both pre- and post-launch. Once proven safe and reliable, an AI system could even assume some on-the-fly control of a rocket's guidance and operations. "So far, rockets are merely automatic. They are not artificially intelligent," said Yasuhiro Morita, a professor at Institute of Space and Astronautical Science at JAXA, Japan's aerospace organization. Morita is also the project manager for the Epsilon launch vehicle, the rocket JAXA plans to take big steps with toward autonomy over the next few years. The rocket is slated for a 2013 maiden voyage, although there is no word if the recent devastating earthquake and tsunami might delay the project. Modern rockets have some degree of automation, as well as onboard sensors that inform engineers on the ground about trajectory, malfunctions and so on. But the setup is rather like a "check engine" light in a car that alerts the driver to an unspecified problem and neither offers nor implements a solution. In contrast, data from various sensors in the Epsilon launch vehicle will come together in an electronic "brain" that, like our own, can then issue commands to the rocket's "body." "The AI will diagnose the condition of the rocket, but it is more than that," Morita said. Should there be an issue, "the AI system will determine the cause of a malfunction," and in some cases correct for it. One example of this AI in action could be the regulation of the electrical current that controls the orientation of the thruster nozzle. Where the thruster is pointed determines the rocket's direction, and a surge or other irregularity in the nozzle's electrical current can send the rocket off course. Applying AI in this way is quite similar to its use in electrocardiograms that interpret the human heart's electrical signals in order to evaluate organ function, Morita noted. Epsilon's AI also seems to draw on NASA's Deep Space One probe, which launched in 1998 and was retired in 2001. That project stands as the most notable application of AI to rocketry, said Henry Kautz, president of the Association for the Advancement of Artificial Intelligence. Onboard computer programs allowed the probe to devise its own plans for achieving goals set by human operators. Deep Space One took stock of its condition and executed tasks instead of waiting for detailed planning via remote control from human operators. The probe also demonstrated the first use of AI for spacecraft navigation, which could help rockets reach their orbital destination for deploying satellites or maybe even astronauts someday. Deep Space One's autonomous navigation system directly adjusted engines based on optical observations of asteroids against a backdrop of stars to provide orientation. All such systems could grant rockets greater flexibility in dealing with unexpected situations and reduce time and manpower needs. In other ways, the Epsilon launch vehicle, a three-stage, solid-fuel rocket, aims to cut costs and be a smarter, safer way to send satellites aloft. 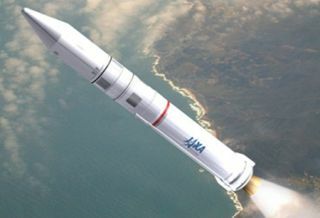 The new rocket will have fewer and more advanced components, such as a lighter, tougher carbon-fiber motor case, than the retired Japanese M-V rocket that Epsilon will largely replace. Fewer and better-wedded components will allow the rocket to be moved to the launch pad almost fully assembled. That's in contrast to current on-pad assembly processes and the many tedious manual checks of rocket systems that translate to launch preparations lasting a couple months or so, Morita said. Once a typical rocket of today is ready for launch and then in the air, its operation becomes the responsibility of mission control – often a large room staffed by dozens of people. By harnessing AI and modern electronic communication technologies, Morita said, the Epsilon rocket could eventually be managed by a much smaller team – perhaps just a few people using laptops. Morita hopes that the cost savings pioneered by the Epsilon launch vehicle point the way for getting more rockets into the sky. The Epsilon launch vehicle is being designed for small satellites weighing 500 kilograms (about 1,100 pounds) or less, as well as low-Earth orbit satellites up to 1,200 kilograms (about 2,650 pounds). Safety, of course, must remain paramount, and experts not involved with the Epsilon launch vehicle project are a bit skeptical of just how much AI should be relied on in the dangerous field of rocketry. "You don’t want to allow any ambiguity in a launch vehicle," said James Wertz, president of Calif.-based Microcosm Inc., a company that specializes in reducing space mission costs and is developing a low-cost launch vehicle. With this in mind, JAXA is looking to take things slowly and will not have a vehicle be the judge of its own guidance and flight performance until several years along in the effort. Overall, however, the general trend toward greater automation and reducing the number of people needed for a rocket launch "makes a lot of sense," Wertz said. "I imagine this would be difficult to do for very large rockets," said Panagiotis Tsiotras, a professor of aerospace engineering at the Georgia Institute of Technology who is not affiliated with JAXA. "When the stakes are not as high for smaller rockets, you could see this. But you have to trust the program to do the right thing." This story was provided by TechNewsDaily, a sister site to SPACE.com.